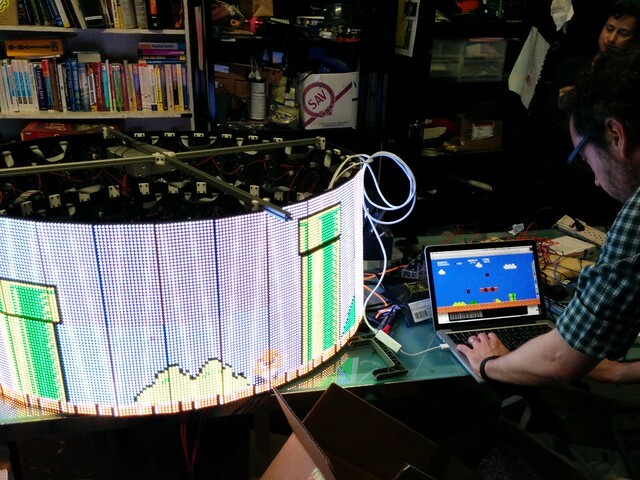 Megascroller is the 512×64, 32-sided upgrade to Octoscroller, which was the eight sided RGB update to the venerable six-sided red LED Hexascroller. Megascroller is featured as one of the art pieces at the upcoming Interactive Show — on the giant cylinder you can play different video games in the round. Unlike normal side-scrollers, you have to move sideways to keep up with the onscreen characters. Here’s a video as we play-test Mario (source code) and discuss some tweaks to the game to enhance the fun (there is some interaction with the camera shutter that makes artifacts in the movie).